This photo almost never happened. True North Mark and I were still in Nannup late in the afternoon and trying as best as we could to get to the coast to try and capture sunset. We really cut this one very close so close in fact that once we drove into the carpark we quite literally leapt out of the car and had to run down to the beach and only had about a minute to decide what angle we wanted to shot from and setup our gear. I decided to head down to this jetty and see what I could get, while Mark decided it was a great time to combine a 2km run with a sunset shoot. He was running all over the beach like a man possessed. Good fun to watch. 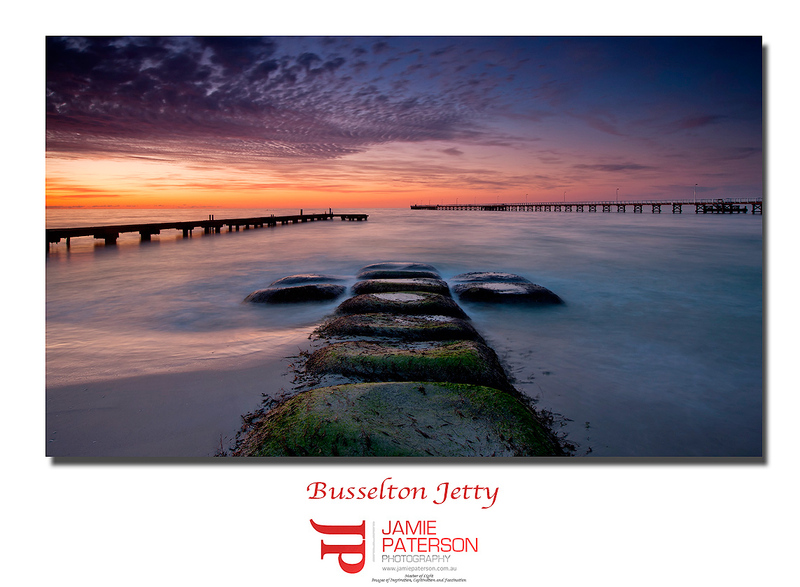 This entry was posted in australian landscape photography and tagged australian landscape photography, Busselton, busselton jetty, coastal photography, landscape photography, seascape photography. That came out really well mate! Sweet! Thanks very much mate. Appreciated. Imagine what we could’ve got if we were there 5mins earlier. Hey Brett. I was actually sitting in the car getting frustrated as I could see it was going to be a killer sunset and we were still ages away from the coast. Fortunately we made it. Hey Pete. Thanks very much mate. Appreciate it. Thank you Chloe. I’ve got more photos from this spot. Hopefully everyone will like them as well when I put them up. I like this one Jamie, a bit different to most compositions from there. Great result ! Great comment Tony. Thanks very much mate. Just goes to show that you can always find a different angle if we try. Well well mr Patterson, mmmm killer image indeed!! HI Adrian. Thanks for that. There was actually very little thought put into this photo. I’m trying to shoot via instinct at the moment rather than thought. Maaate, considering you were probably stressing about losing the light you have come up with a cracker! Nicely done! Gy’day Tim. Thanks mate. You’re not wrong it was literally a mad rush down to the beach. Love it. Some times when you have the least time to act you make the right choices. As most have said great colours and angle. I have not seen the jetty take like this before, well done. Thanks very much guys. Really appreciate you visiting the blog and your comments. Go Margaret Rive! Stunner Jamie, lucky you guys were quick enough, see your healthy lifestyle change is paying off for you. Whoooo.